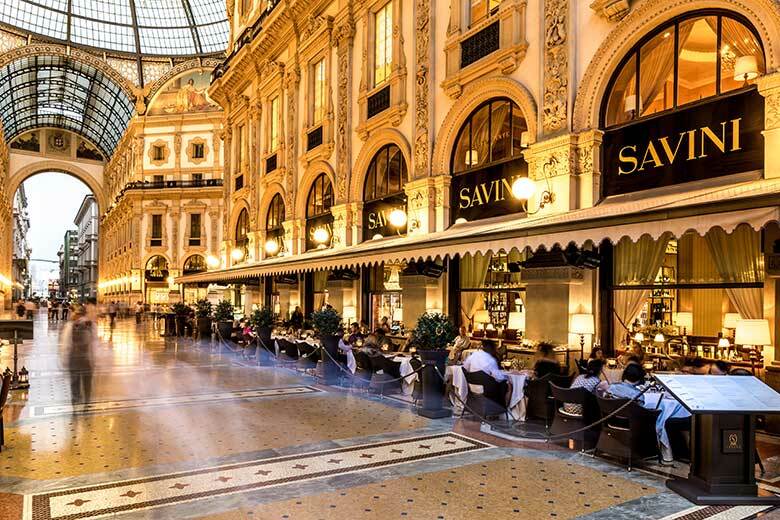 Since Savini first opened in Galleria Vittorio Emanuele II, it has maintained the timeless elegance of the Belle Epoque. Savini was the favourite haunt of some of the world’s most illustrious names, including Verdi, Puccini, Toscanini, Maria Callas, Eleonora Duse and Filippo Tommaso Marinetti, who wrote the Manifest of the Futurist Movement here. Savini recently celebrated its 150th anniversary and boasts a continually evolving legacy in which tradition and innovation are intertwined. In 2007, the Gatto family took over the reins of this Milanese landmark restaurant, which is now divided into two spaces: a café/bistro and a restaurant. The café/bistro – open throughout the day – can be accessed from the Galleria and is the ideal place to enjoy a cup of coffee, tea or an aperitivo, while the restaurant is located on the first floor. Here, amidst period furnishings and soft lighting, you can opt for a traditional or more contemporary menu, signed by chef Giovanni Bon. For an impressive business lunch, in an elegant, historic setting, the restaurant offers a business lunch formula, featuring a choice of gourmet dishes. open Mon-Fri 12pm-2pm and 7pm-10.30pm. Sat and Sun 7pm-10.30pm.